Since the weather isn’t letting up and snow is already falling in New York City tonight, why not stay in this weekend and make this deliciously easy Chorizo and Sweet Potato Enchilada Casserole? 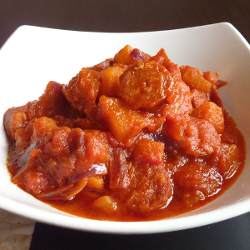 With soy chorizo this recipe can easily be made vegetarian/vegan! Crockpot Challenge #1- Chorizo and Sweet Potato Enchilada Casserole. Previous Entry:Staying Inside and Still Feel the Need to Warm Up?